Buyer beware . . . Looking for a tattoo—and maybe a little something extra: a burst of good luck, a dollop of true love, or even a hex on an ex? Head to the quiet and mysterious Gage, the best skin artist in town. Using unique potions—a blend of extraordinary ingredients and special inks—to etch the right symbol, he can fulfill any heart's desire. But in a place like Low Town, where elves, faeries, trolls, werewolves, and vampires happily walk among humanity, everything has its price. No one knows that better than Gage. Turning his back on his own kind, he left the magical Ivory Tower where cruel witches and warlocks rule, a decision that cost him the right to practice magic. And if he disobeys, his punishment—execution—will be swift. Though he's tried to fly under the radar, Gage can't hide from powerful warlocks who want him dead—or the secrets of his own past. But with the help of his friends, Trixie, a gorgeous elf who hides her true identity, and a hulking troll named Bronx, Gage might just make it through this enchanted world alive. 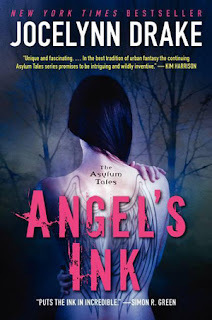 OH, wow, I wasn't expecting the thrill ride Angel's Ink truly was. This was my first book by Joecelynn Drake and what an intriguing urban fantasy world she created. I liked how her main character is a guy named Gage, a human warlock with a natural provocation for magic. He was raised by a mean wizard, Simon, in the Ivory Towers but walked out at sixteen after besting his teacher in a battle. Since then he has been making his way on his own in Low Town, the human world where people flee from the sight of witches and warlocks who act like Gods because they have powers. These supernatural beings are the reason for the war which changed the land and made humans lesser life forms than the magic wielders. Gage is an outsider and doesn't subscribe to the propaganda of the witches and warlocks. Gage is also an exception--the Council let him live and leave their land with the understanding he is not to use magic. He first apprentices with a tattoo artist, then opens his own shop, aptly named Asylum. Under his employ are an elf, Trixie, and a troll, Bronx. Of course, each character has their own secrets but exist in the peaceful solitude the shop offers each one until they've become a sort of family. Telling a warlock not to use magic is like telling a drunk he can't have another drink. Gage needs to use magic, whether in warding his store or mixing inks to help his customers. Trouble seems to find Gage easily and that's how we meet him. Mixing special inks infused with magical imbuements is a very cool trick and one I liked reading about. Gage is a good guy with a runaway mouth and quickly became my favorite character. His battles, the way he thinks fast under pressure, his unique skills all drew me in to liking him a lot. Drake has created an urban fantasy fans of this genre will enjoy. The story did slow down in parts but I was already a Gage fan girl and wanted to know what happened next (plus, I needed to catch my breath). The world building was good though not as in depth as in other urban fantasies and yet I have to wonder what the author has prepared with us in the next installment. I'm pretty sure Gage is going to have to make a trip to those Ivory Towers with the seed of an impending revolution already sprouting, and I expect that to be GOOD. The romantic parts of the story were sweet but not saccharine, especially coming from a male pov. Gage's love for Trixie came across as realistic and believable. The one surprising element of the story I really liked was Gage's relationship with Gideon who was his warlock parole officer. Gideon turned out to be just as complex as Gage and I can only wonder what type of role he will take on in the second book. What made Angel's Ink stand-out in this genre is the varying assortment of characters Jocelynn Drake created. What a cast: from Gage to Chang to the witch turned enchanted cat, Sophie, it is the strength and depth of the people, human and magical, that make Angel's series the wonderful read it is. I eagerly await the next book in The Asylum Tales, Dead Man's Deal in May. “The other thing you have to consider is that tattoos are permanent, regardless of those stupid commercials and other so-called cures. You’ll have to live with this very large tattoo for the rest of your life.” In general, I wasn’t in the business of trying to talk someone out of a tattoo, but I believed a person should make an informed decision before jumping into such a big commitment. “I can’t think of anything better,” she whispered, hanging her head down so that her hair blocked her face. However, I didn’t miss the quick motion of her hand sweeping up to her eye to catch what I was willing to guess was a tear. Placing my elbows on my knees as I leaned forward, I cupped my right hand in my left, massaging out some of the tension that had settled there. I was beginning to guess where this was going and it was becoming increasingly harder for me to say no to this woman, which was going to be my downfall in the end." Cover comment: I like how the model is supposed to look like Tera and she does. The bare trees in the background are dull and not reflective of the story (besides being dark). Something else could have been added to liven up the cover a bit more, something more.... Magical. Wow! I don't know how this book has avoided my radar until now, but I'm definitely adding it to the wishlist! Hope you get a chance to read this. I think you'll really like Gage! I really liked your review. I have to check out this book, I think I would definitely enjoy reading it!